Yes Fall is in full swing right now. The leaves continue to fall. I will post updated pics probably tomorrow. I see some yellows and purples now in what were once green leaves. I find it so beautiful. I do enjoy the fall but along with it comes allergies. Ragweed is a nasty little weed this time of year. I do enjoy the chill in the air and the crunch of the leaves under my feet though. I am not really a huge fan of cold weather but until it gets to be around 20 degrees I am ok. I do enjoy a good snow sitting on the couch with a warm cup of hot chocolate and a good book. :) What is your favorite season? I was featured on the news with my daughter Gabriella a few months after her birth. I recorded it with my digital camera off the tv so sorry for the poor quality. It was a long drive. It's almost a four hour drive. I was running a bit behind today. I picked the girls up from school and we started off. We got there and as usual Gabriella is quite the star. Those doctors and nurses watched me go from around 92 pounds, frail and sick to around 127 pounds round and pregnant. Now I am back down around a comfy 102. They saw Gabbi grow from a tiny little baby to a big 11 month old little girl. One of the nurses snatched her right away and started walking her around showing her off. She loved it and was waving at everyone! It was so cute. Now yes...I know I am making you all wait for the news. haha I have to. The doc came in and I told him about the pressure of course. We discussed this and basically, I do have scar tissue but when my veins got pretty much blocked off from the tumor he said my veins started to reroute or move and the blood flow tried to go other ways. I know our blood will do this, such as in when someone has a stroke. The vessels can find new paths...maybe even create new paths. I am not 100% positive. I do feel pressure but usually when doing things like singing, talking a lot, crying, or anything involving the upper chest area. Doc said I may always have it, I may not and maybe I'll just get used to it. I may just not ever be normal like I used to. Things aren't the same and he did notice the veins in my neck as I always do. I hate them. He felt my lymph nodes, and they were perfect. He said I am so skinny that he'd feel even a slight swelling. hee hee. I tell you, he always talks about how skinny I am. =/ I don't necessarily mind really. haha My blood work came back great. My checkup went perfectly. STILL in remission!!! Thank God! I am really relieved. I started to get worried. This pressure has always been on the back of my mind. If I wear shirts that tie around the neck, I feel it. It's never been like what it was when I was sick. Yet it is there on occasion and it makes me very nervous. Now to top the day off we decided to go out to dinner at TGI Fridays. I loved it. We haven't gone out to eat in so long. It was so wonderful. Then we stopped later to get gas and some drinks. I saw a breast cancer lottery ticket. All proceeds benefit breast cancer so I thought, I'm gonna do it. I'll buy one. I am feeling lucky. I also felt good that my money would go somewhere good even if I lose, the money goes somewhere good. You match your winning numbers or get a 10 and win all ten prizes. I got a 10!!! I won $25. Yeah! :) I never win on scratch tickets. I am happy, relieved and glad that long drive is over. My next appointment is January 23rd. I'm sure I'll get this way again. I always do. I appreciate so much all the comments and words of support. It's so hard doing this. I know in 5 years I will be considered cured. I have to be in remission for 5 years. So, as of February 2009 it will be just one year. I found badges online for each year of remission. I hope to continue adding badges each year! Just click my picture when you get there. 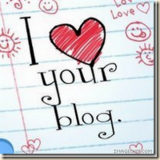 If you add your blog I promise to click for you too! Just let me know. Well, today really didn't start off right. I overslept first of all. I guess I forgot to set my alarm clock. I lost my voice Saturday, about an hour before my sister's birthday party. It's a bad time to lose your voice because my sister loves to sing, as do I and I'm sure I would have tried to sing a tune with her. That of course couldn't happen. I am waiting for my voice to come back but to no avail. It's still gone. I woke up today with terrible upper back pain. I get this from time to time...especially if I spend time drawing, which I did yesterday. I lean over too long and don't stretch enough. I blame only myself. 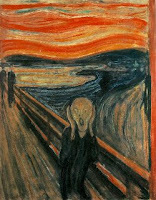 So I have a sore throat this morning as well, combined with a head cold, upper back pain and no voice. I overslept so I kept the kids home. I didn't really want to, but I also felt pretty awful and didn't want to have to go in to the school and explain we overslept. I decided this one time, to stay home. I hope tomorrow I feel better! It's not all awful. I am sitting here curled up with my 8 year old. It puts a smile on my face. I'm including a picture of my sis and I at her birthday party. It's almost here and it's a pretty good thing. I think the anxiety is finally getting to the hubby too. I don't know what it is but I think I start to actually FEEL symptoms the closer I get to the appointments. I really do think at least some of that is in my head so I don't let myself get crazy with worry but it is stressful. We were watching that movie with Harry Connick Jr. last night. I forgot the name of it. He finds a medicine for breast cancer that saves lives. I thought it was wonderful but it still put me in a mood. I get so sad and it reminds me of how I felt. I am thankful for how I feel now! I feel good and that's a wonderful thing. I enjoy the drive to my doctor. We moved in February a good four hours away. It used to be about an hour and a half. After much debate we decided to not switch doctors. I have been going to him since the beginning and I just trust him. He knows my whole situation from top to bottom and that gives me comfort. My situation was unique so I just didn't feel comfortable switching. I would have, if my appointments were more frequent. I would have no choice with the cost of gas but since it's just every 3 months we decided to do it. I will definitely post an update when I get back! It's a beautiful drive. I hope to get some good pics of the fall leaves. Here's another old pic of Gabbi at birth. She wasn't bad zized for four weeks early. Oh and please don't forget to click the top momma thing every day! I am falling off the top of the list. Just click the top momma banner over on the right and click my pic. Sign up for yourself too. See how long you stay on top!! I get tired of hearing it. I really do. Every day, something else causes cancer. Or so they say. I have been warned for years about saccharin. Stay away from artificial sweeteners! Then I hear drinks with sugar in it can cause cancer. So, I can't drink anything sweet? Don't even get me started on the whole deodorant thing. I get tired of rumors. I get tired of hearing cell phones cause cancer, diet sodas may cause cancer, and something about air fresheners now. Is it really possibly to avoid all risk? It's not. I quit smoking when I was a young girl. The thought of it disgusts me now but yes I did smoke for a couple of years when I was about 20. The thought of smoking actually hurts. I avoid smoke as much as I can. I actually am not too surprised about air fresheners because they hurt to breathe in when I was sick. Seriously. We had bought a lot of those oil kind. At my worst when I came around them it burned my throat when I breathed in around them. I went around my house pulling them out of the plugs. Then again, it hurt to breathe in dust or to be around the dog too. It's odd. I am not really sure why. I can't forget cooking meats might cause cancer. I read something about grilling food and nonstick pans too. How are we supposed to realistically avoid these things? I am not going to stop living. I am not going to eat plates of rabbit food every single day. I'll take a vitamin and I'll do my best but I will not stop living. Of course, my very own cancer treatments can cause cancer. So, especially since they have no clue what causes Hodgkin's it bothers me. I can't avoid what causes it because they don't know. Then again, I suppose there are many cancers like this. I have had people message me about natural remedies and all that. I was much too sick to be helped by anything other than chemo when I had it. I was informed I would not last three weeks. No amount of vegetables would have kept me from dying. I needed that treatment and it worked. I admit I need to improve my diet and I am a strong advocate of trying to eat right but I don't think we can all live our lives based on what new thing is a carcinogen. I honestly ask myself why they tell us what causes cancer. Tell us what DOESN'T because in this day and age it seems like everything causes it. Or maybe that's just me. Thanks to On the Verge for giving me these awesome Blog Awards today! 1. Slap this baby up on your blog. Don’t be shy. 2. Link to the giver. 3. Nominate up to seven other fab blogs. 4. 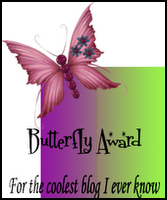 Post links to those super fly blogs your nominating. 5. Leave messages for your recipients on their blogs…so they can feel as special as you.